yelp-restaurant-industryA recent Harvard Business School study by Michael Luca shed light on the impact of Yelp on restaurants, both individual independent restaurants and members of a chain. 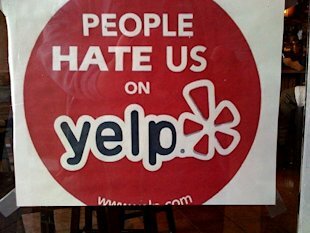 Yelp.com has been one of several sites helping to revolutionize not just the restaurant review industry but the restaurant industry as a whole, because it covers far more restaurants than any written publication can. For example, while, as of 2009, in Seattle, about 5% of all restaurants were listed in the Seattle Times, approximately 70% of all restaurants were listed on Yelp. Luca studied the effects of Yelp ratings on the revenue of restaurants and discovered several interesting findings. Studying the relationships of restaurants&apos; revenues to their Yelp reviews in Seattle over a period from 2003 to 2009, he found a significant relationship between a restaurant&apos;s average rating and revenue. One star&apos;s worth of improvement on Yelp leads, he found, on average to an increase of between 5 and 9 percent in revenue. The average rating is more important than the review, as many Yelp users are overwhelmed by the sheer number of reviews on many restaurant pages and find it easier to consult the star rating. Luca also found two features which exacerbate the effect on revenue Yelp has. First, the more reviews a restaurant has, the more impact an increase in its Yelp rating will have on its revenue. Second, the more reviews by Yelp "elite" members, the more impact; "elite" reviews have almost twice as much impact as other reviews. However, Luca found a far different picture regarding chain restaurants. Chain restaurants are those with multiple locations and common menu items and account for $125 billion of revenue each year, over half of all restaurant spending in the U.S. Unlike independent restaurants, chains showed no relationship between Yelp rating and revenue. Luca theorizes that because the main advantage of these chains over independent restaurants is greater knowledge of what the consumer will receive as well as consistent food and service between locations, the increased knowledge that Yelp provides doesn&apos;t impact consumers interest in these restaurants. Building on these two pieces of knowledge, Luca predicted and confirmed through his research that as Yelp becomes more prevalent in a market, interest in independent restaurants increases, relative to chains. This may indicate that consumers, with the help of more restaurant reviews, are able to close the information divide and find restaurants they prefer more than chains. This may then require chain restaurants to bear down and improve their quality if they want to prevent customers from leaving in droves in the future.